Aragon, A.; Sanz, J.; Juan, J.; Hernandez, M.; Altadill, D.
The FORMOSAT-3/COSMIC satellite constellation has become an important source of remote sensing data globally distributed for the sounding of the atmosphere of the Earth and, in particular, the ionosphere. 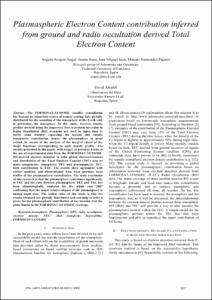 In this study, electron density profiles derived using the Improved Abel transform inversion in Radio Occultation (RO) scenarios are used as input data to derive some features regarding the topside and outside ionospheric contribution, hence, the plasmasphere in great extend, by means of the analysis of the integral values of the shape functions corresponding to each density profile. The novelty presented in this paper, with respect to previous works, is the use of experimental data from the FORMOSAT-3/COSMIC RO-derived electron densities to infer global characterizations and distribution of the Total Electron Content (TEC) into its main components: ionospheric TEC and plasmaspheric TEC, both contributing to TEC. The results show agreement with earlier modeled and observational data from previous local studies of the plasmaspheric contribution. The main conclusion of this research is that the plasmasphere contributes significantly to TEC and the ratio between plasmaspheric TEC and TEC has been climatologically analyzed for the whole year 2007 confirming that the major relative impact of the plasmasphere is during night time. The added value of this study is that the results obtained are globally distributed and can help to infer a proxy for the plasmaspheric contribution at any location over the globe thanks to the FORMOSAT-3/COSMIC coverage. Aragon, A. [et al.]. Plasmaspheric Electron Content contribution inferred from ground and radio occultation derived Total Electron Content. A: International Conference on Communications and Electronics. "2012 4th International Conference on Communications and Electronics, ICCE 2012". 2012, p. 257-262.